I have commented on here more than once about how many of the daily email deals through places such as Groupon or LivingSocial or Crowd Cut are for golf courses that, frankly, I wouldn’t want to play. This morning, there were two golf related deals in my inbox. The first was for Rum River Hills and that one was immediately deleted. The second was for Big Fish in Hayward, Wis.
And I bought that one. Immediately. 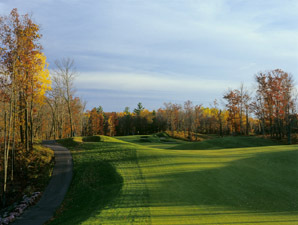 For $29.50, you get 18 holes and a cart at the Pete Dye designed course (No. 17 is pictured above).This is a crazy good deal. Basically for the price it would cost you to play Hiawatha or Phalen, you can make the 2 hour drive to Hayward and tee it up on an awfully good golf course. The regular weekend rate for 18 holes and cart is $60. I think Big Fish is a very strong golf course with two distinct nines. The front is more wide open while the back is routed through trees with some nice elevation change. I’ve played the course twice and enjoyed it very much each time. I haven’t been up there since the summer of 2009, so this is a great excuse to make a return visit. To put it in perspective, if Big Fish was in the Brainerd area, I think it would rank only behind The Classic and, perhaps, Deacon’s Lodge. So click on the link above and put yourself into some quality golf at a very, very fair price. And as an added bonus, if this Minnesota government shutdown continues for much longer, you can also restock your supply of MillerCoors products while you\’re across the border. Sounds good. I’ll book one foursome. Your following is bigger than that– see if they allow fivesomes! Missed the deal but would like to make it.